A work in progress shot of a new work. Plenty more to be done. Forgive iphone image quality. Shot on the go. Hi All, I will have a painting included in a group show in New York - opening this Thursday. The group called "IDIR" consists of Irish artists and this is our first show in New York. The exhibition will be opened by upcoming Irish musician Hozier on Thursday October 9th. Unfortunately I won't be attending but if you happen to be in the area please drop by ! Location: NYFA's Offices, 20 Jay Street, Suite 740, Brooklyn NY. The exhibiting runs until the end of January 2015. Mon to Fri from 9.30am - 5.30pm. Do drop in! This new work is called "Runner with basket of fruit". The title may seem a little odd but it hints at the process of the works creation. I am fascinated by the intersection of art and technology and specifically how developments in technology can influence the progress of painting. 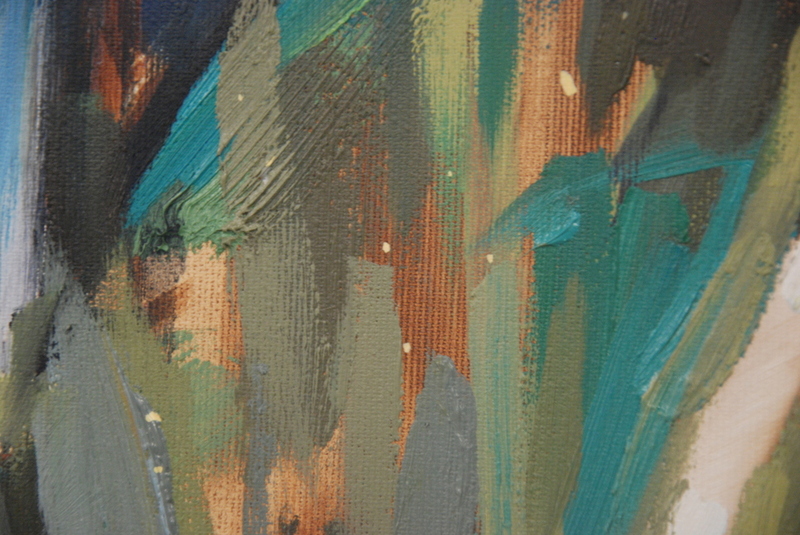 As always I spend a lot of time digitally creating my reference images before creating the oil on canvas painting. In this work, I manipulated a found image from the Troubles period and have incorporated an old Caravaggio work (" Boy with a basket of fruit" ) into the fabric of this new painting. The Caravaggio painting is in a sense, branded into the initial image using a digital technique called "displacement" - The mixing of the two images gives rise to some unpredictable forms and amazing details that one would not be able to comprehend using the brain alone. It creates wonderful ghost like forms. For example, the pinkish/blue hue at the back of the runners balaclava is the imprint of the face and the eye from the original Caravaggio painting. Also, the fern pattern in the bottom right melting into the runners jacket. With this type of process I am releasing a certain amount of control and allowing technology to inform a lot of the decisions. 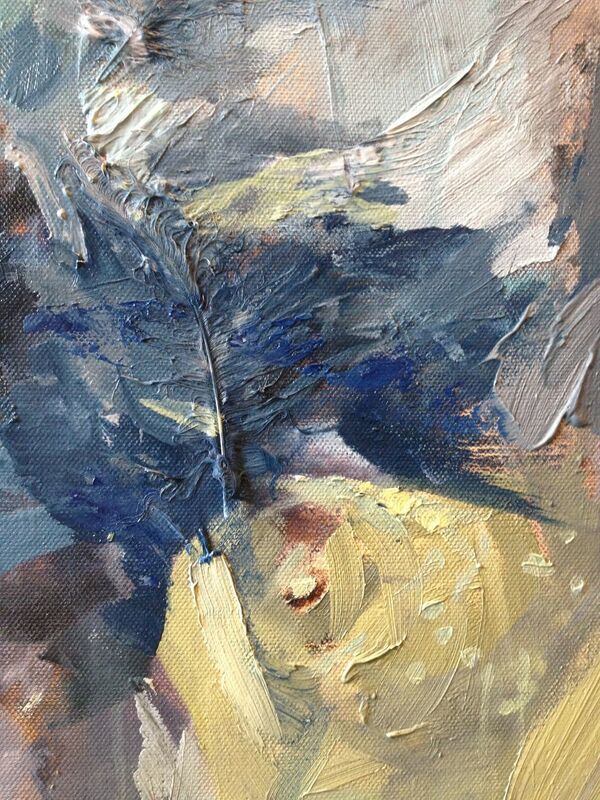 Its an exciting way to approach a painting and creates a lot of spontaneity in the imagery that one can create. I will be expanding on this method of image construction going forward to see what new possibilities it can bring about. I just wanted to give a quick run down on the "Retrospect" exhibition in Derry and thank everyone of you that came along to see it. I was overwhelmed by the support and how my work was received. We had an exceptional turn-out, with thousands of people coming through the doors. Installation shot of "Displaced in conflict"
Below is a taste of some exhibition shots. The elegance and history of the building really added to the exhibition and made for a truly special event. Also, I wanted to congratulate the organisers of the Lumiere Festival - it was an amazing event and had a great impact on my show also. New Limited Edition Prints Available! I have been getting a lot of requests for prints recently, so just in time for Christmas I am releasing a run of Limited Edition Giclee prints of both " Bernadette" and "Gold". 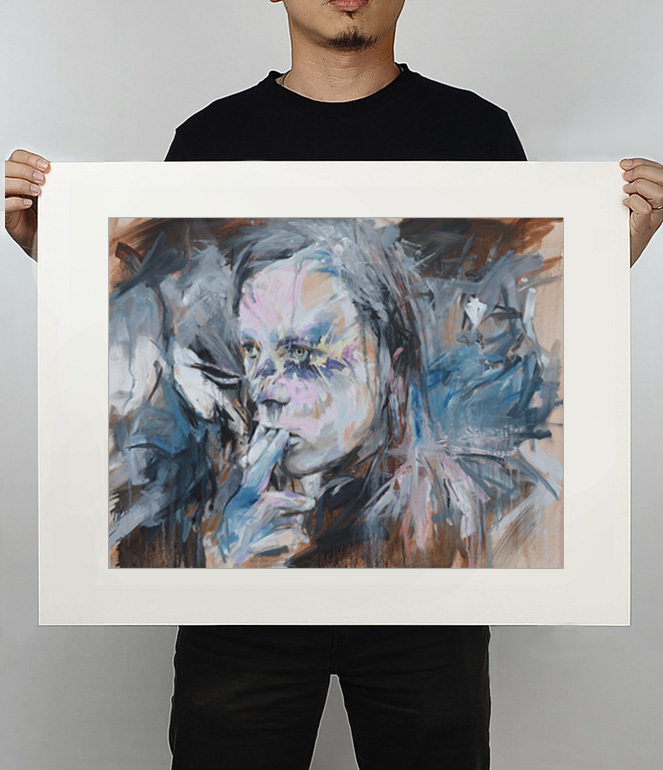 Each will be a Limited Edition of 50 and will be signed by the artist. Click here or on the "Prints" link to the left. Just to note - orders must be placed by Friday 13th December to be guaranteed delivery in time for Christmas. I am hosting a solo exhibition "Retrospect" in Derry City, N. Ireland. The show will run from November 29th to Thursday 5th December. The opening of the exhibition will be at 7pm on Friday 29th November and everyone is welcome. The exhibition is a real milestone in my career for a number of reasons. It is the first solo show I will have in Derry, which has a special place in my heart as it is the largest city close to Buncrana where I grew up. I also attended the University for 4 years here before moving to study in Germany & then setting up my studio in Dublin. It has a sort of a homecoming feeling for me and I am excited to show the work to my "home audience". Being able to show my work to friends & family who normally don't see my work in person as I usually show in Dublin or abroad add's something very special to the event. Being able to show these paintings in the building that used to serve as the Bloody Sunday Trust building seems to me like some kind of fate. The combination of all these elements will make for a very special show. *If you like this post please subscribe to my studio members list. Its the best way to keep up with my work. This painting explores the punishment method of Tarring and Feathering. Mostly used in Feudal Europe it has popped up in different instances throughout recent history. In 2007 a drug dealer in Belfast was Tarred and feathered in an act of vigilante/community justice. The Subject in this painting was the victim of tarring and feathering in America in the early 1900's. 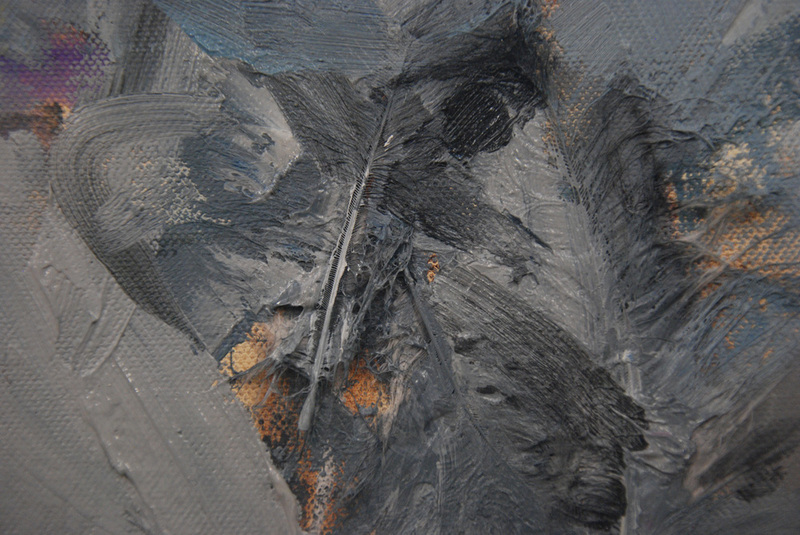 I layered tar and feathers in with the oil paint which was a technical challenge in itself. I have mimicked where the original feathers were attached to his body. I see the tar and feather inclusion as a type of bridge, a connection to the event itself. As always technology plays a big part in the preparation of the image I paint from. I have layered many different images onto a single black and white photo which informs the colours. The layering of images and colours also for me represents the skewing of memory over time and hints at technologies place within modern society. Canvas building in the glorious Dublin sun today. 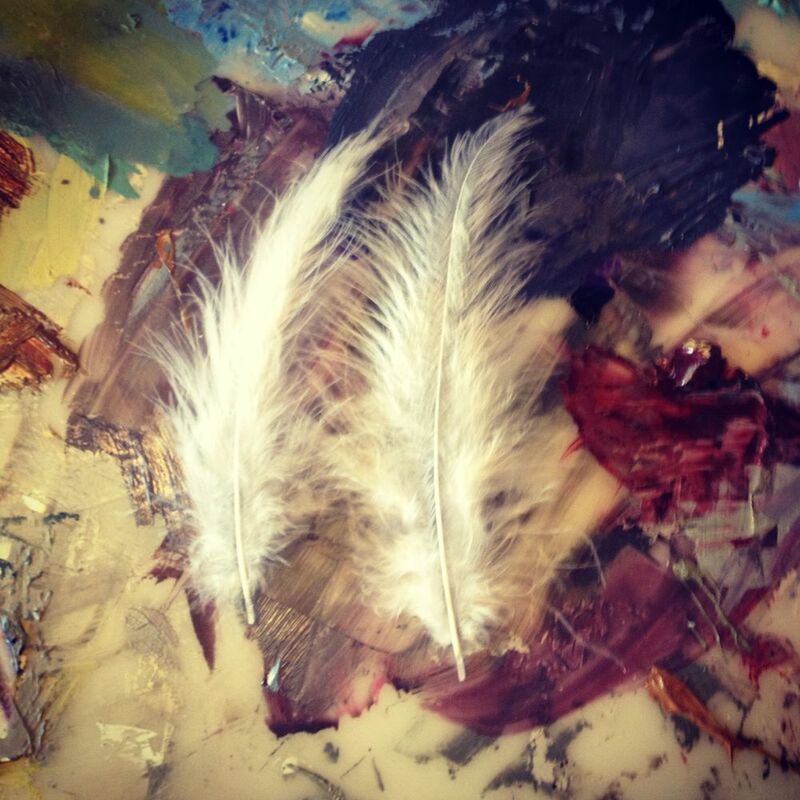 Details of the feathers in a new work inspired by the punishment technique of tar and feathers. Click to see larger. Recently I was reminded of the punishment practice of tarring and feathering a person. It was used in feudal europe and its colonies.Though tar and feathering has seemed to die out for today's society, there have been some reported instances recently. In Belfast in August of 2007, a man was tar and feathered, and then tied to a lamppost, with a sign around his head, reading "I'm a drug-dealing scumbag." My most recent painting explores this and I have decided to take a literal approach, incorporating tar and feathers as a medium in the piece. There is always a bit of a technical challenge when dealing with new materials, and this will be no different. I will post details as it progresses. The subject of the painting was a victim of tarring and feathering. Here is a progress shot of the painting currently - pre-tarring and feathering . I am taking part in a group exhibition tonight in Filmbase, Curved Street Temple Bar. Come along and enjoy if you are around. Currently on the easel. An army defector who was tarred and feathered ! More coming soon. Canvas building time in studio! 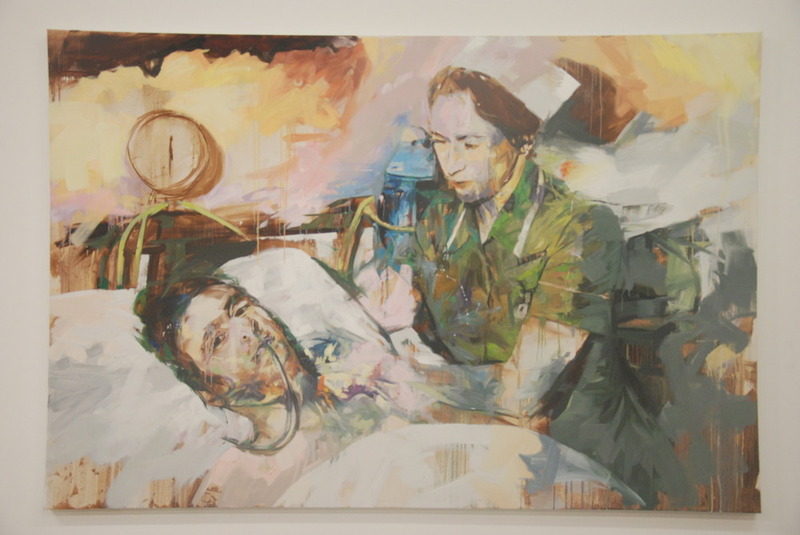 A selection of Images showing the details in the painting "Hospital". I will be taking part in the New Living Art III exhibition at IMOCA ( Irish museum of Contemporary Art )starting this Friday 16th November. 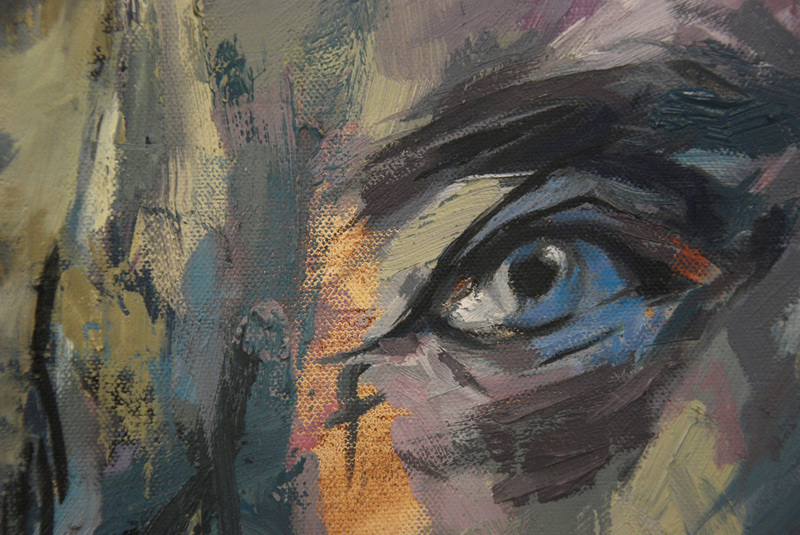 Iwill be showing 3 new large paintings and there is some great work by upcoming young Irish artists. "Pre Op" high resolution viewer . RHA prize winner. In May a painting of mine "Pre-Op" was exhibitied at the RHA ( Royal Hibernian Academy) in Dublin. I was also lucky enough to receive The Whytes Award which was a great honour. The painting has now moved on and wont be on display publicly anymore so I enlisted the help of Uber-Photographer Con O Donoghue and creator of amazingly huge images to capture a high res version of the painting so it can be viewed better online. The image is made up of many tiles and shows the painting in amazing detail. Zooming into the eyes is particularly rewarding. I am convinced you can see more detail in this viewer than you can in person. View in fullscreen for best results. Fullscreen button is at bottom right of viewer. I am taking part in a group show in Moxie Studios in Dublin until 30th Sept.
"Just in time for the apocalypse" . 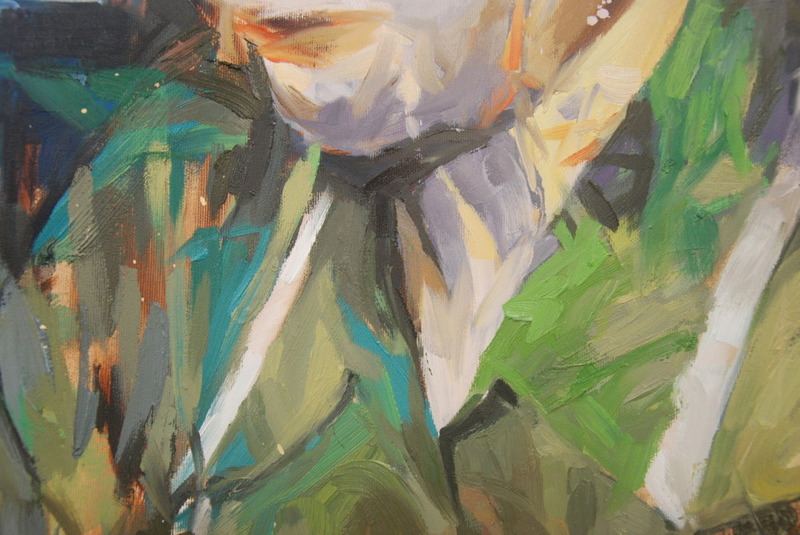 I am showing paintings from a new series " The Troubles".